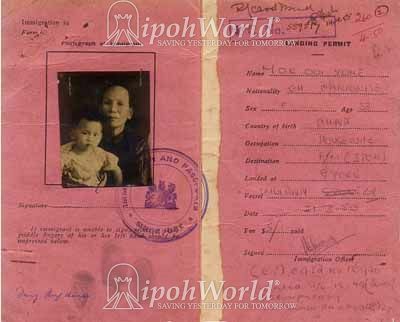 This permit for Mook Ooi Yoke, Cantonese, aged 33 allowed her to land at Singapore. She was then required to obtain an identity card from the Registration Office of her preferred area within 30 days from the stated date. She was a housewife from China, who landed in Singapore on board the ship Muihann and was going to Ipoh, accompanied by Foong Ang Hong, her husband. 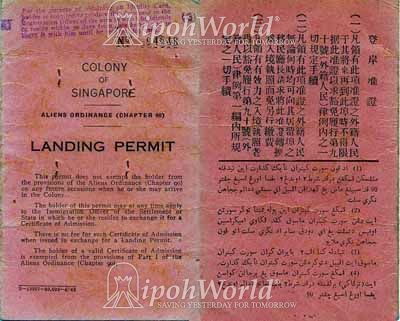 This permit was issued on 21.3.1950 with a payment of $5 and certified by the Immigration Officer of the Immigration & Passports Singapore. The document must be carried by the immigrant until the identity card is obtained. The card is in English (front), with Chinese and Jawi on the reverse.